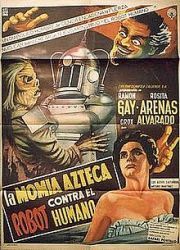 Thanks to hypnotic regression and plenty of flashbacks, Dr. Almada (Ramón Gay) discovers his wife was an ancient Aztec in a past life. She was sacrificed with a bracelet and breastplate that told the location of a vast treasure. Buried with her was a warrior she had fallen in love with. He is cursed to become a mummy and defend the treasure. Enter Dr. Krupp (Luis Aceves Castañeda), or as he likes to be known as… The Bat, an evil psychiatrist who really wants that Aztec gold. The mummy proves to be a tough opponent, and The Bat decides he needs to build a robot to fight it. For sixty-five minutes, The Robot vs. The Aztec Mummy delivers non-stop ridiculous moments; long flashbacks complete with dance numbers, a super-villain who looks silly in and out of his quasi-luchador costume (did I mention he keeps a snake-pit in his lab for no reason? ), and a killer robot who does not possess flexible knees, are among the highlights. Outside of the threadbare production, and questionable dubbing, the major flaw of this film is that it takes too long to get to the title bout, and instead wastes time with a lot of needless back story. The actual battle itself is far too brief, but considering the costumes the actors were saddled with, they could barely move anyway. The Robot vs. The Aztec Mummy should be congratulated for living up to the absurdity of its title.